methi chapthi looks perfect and healthy!! Methi chapathi, a perfect complete lunch with a raitha. Yours looks very nice and loved the simple version. vethayakeerai chapatis look perfect !! I love them with sour chutneys!! Yummy these look delicious.We call these thepla in gujarati. Just so that you are aware everytime I click on your blog ,it keeps diverting to some advert instead of your blog. Methi chappatis looks delicious and tasty! !ya, your blog keep diverting to some advert..plz can you check..
Hi friends, Thanks for your comments. I am checking on it. Thanks for letting me know. will sort soon. Yeah its a very healthy option...i make parathas with this. 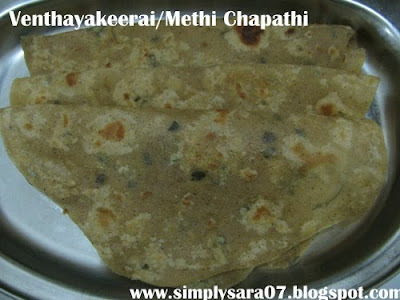 Methi chapathi sounds too good..very healthy..